Activision displayed some very promising new games at the January Consumer Electronics Show in Las Vegas. Of the many impressive offerings, Robotank by Alan Miller promises to be the blockbuster both at cash registers and on Atari VCS systems across the country when it is released this summer. Robotank is basically a variation on Battlezone, the vector graphics coin-op arcade game from Atari. 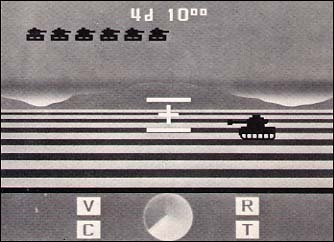 In both games, you are in control of a tank located in the middle of a barren field. You must destroy enemy tanks after pinpointing their positions by using the window view and a small radar scope. When asked if the similarity between the two games violates Activision's policy of no adaptations, designer Miller replied that "there is no hold on this particular concept (the player located within the tank, looking out)." As you can see by examining the screen shot above, the Robotank display is divided into two sections. The majority of the screen is occupied by the view of the battlefield. From your seat within the tank you can see anything that is in front of your tank; conditions permitting. The remainder of the screen consists of the status panel. Located in the center of the status panel is a circular radar display with a sweeping arm. If there is an enemy tank on the battlefield, it will appear on this display as a pink dot relative to your position. Situated around the radar display are four yellow boxes with capital letters in them. These are the damage indicators. When your tank is shot, you suffer either a direct hit or a glancing shot. The first destroys your tank, the latter merely damages it. The type of damage inflicted upon your tank is random. If the V box is on, your video display will flash on and off. C means that your cannon firing power is cut in half. R indicates that your radar has been rendered useless. T simply slows down the turning ability of your tank. The 3-D graphics in Robotank are so advanced, they make the Atari VCS look like an entirely different machine. As you maneuver around the battlefield, the ground rolls toward you in a wavelike fashion, giving the impression that you are actually crawling through little ditches and gulleys. Approaching tanks grow in size, as do shells shot at your tank. Since your score is represented by the number of days and hours that you survive, it makes sense that the game should progress through both night and day scenes. It does. Dusk envelops the field as you witness a beautiful sunset cradled in the distant mountains. When darkness obscures your view, you must rely solely on the radar display and the flashes of light provided when an enemy tank fires. Adding realism to Robotank is the addition of changing weather elements. A sunny day provides optimum battle conditions, but sometimes you are besieged by foul weather. If it is raining, your movement is hampered. You have less control of your tank when it is snowing, and when fog blankets the field, your view is limited. Robotank has no option settings. You begin each game with four tanks--a bonus one is awarded for every squadron of 12 enemy tanks that you destroy. The game can last indefinitely as long as you continue to destroy tanks, but don't count on being able to hold out for too long. As the game progresses, the enemy becomes much more aggressive. Robotank is a game that will appeal to players who enjoy Battlezone and anyone who is captivated by realistic simulations. The version of the game that I saw at CES was an advanced prototype; the finished product may be slightly different. When I get my own copy of Robotank, I plan on locking myself into a room with an Atari and not letting anyone else play for a long time.